Nate Hayden, VP of AOL’s Originals and Branded Entertainment, oversees original programming and branded video for one of the world’s leading premium online video destinations. With nearly two decades of experience in the television industry, Nate is charged with creating content that features authentic voices and stories, focusing on shows that are passionate, relatable, relevant, and true to the ideals and experiences of the hosts. Properties under his charge include Huffington Post, Engadget, TechCrunch, and parent company Verizon’s Go90 video service. This afternoon he was interviewed by media commentator Kate Bulkley. “We started to evolve content a bit in my Originals group—short-form and genre-wise. We’ve pushed into music and sports for the first time in the three years I’ve been at AOL. With Verizon, we immediately multiply our distribution: 150m handsets right out of the gate,” Hayden said. In terms of content evolution, Hayden is looking at “everything from immediate and accessible, vlogger-style content” that “engages with audiences because it’s so immediate.” He admitted such content is part of “mobile content gets a bad rap. But my 14-year-old niece will consume 30, 40 or 50 minutes worth of content” on her phone. He added, “Premium is absolutely still a piece of our mobile strategy.” They’re also focusing a great deal on working with influencers, to cultivate the audiences they bring with them. “Why is (Verizon’s new offering) called Go90?” Bulkley asked. “Again, speaking about my 14-year-old niece, they don’t watch content (vertically); they watch it at 90°.” He tilted his phone onto its side to better illustrate this point. On Huffington Post, Hayden’s team is working on a show called Now What, that will debut on 15 October. It features Ryan Duffy, who worked as a Vice correspondent for the last 10 years as part of its HBO series, as well as in the capacity of journalist. “His experience at Vice was they have a tendency to swoop in and look at an environment, say ‘this is incredibly messed-up, look how bad it is’… then pack up and go,” Hayden revealed. “What rocks your world right now?” Bulkley asked. “Unscripted will always be something that we go after,” he said. “One thing that’s extremely exciting is, in the same way House of Cards and Orange is the New Black stuck a flag in content for Netflix, there’s potential for Go90: What is the opportunity for us to take a new format in scripted drama” and do something cool in mobile? he wondered. “I don’t think there’s a reason to go toe-to-toe with Orange is the New Black, but what will bring us the same energy?” he asked. One scripted drama that caught his attention was HBO’s Silicon Valley: “Silicon Valley on HBO is a show that would have absolutely worked as a TechCrunch show,” Hayden exclaimed. “There are places we are poised to sneak into,” especially with Verizon Go90. This strategy is also something they plan to extend to other publications. “You’ll see even more with HuffPo and TechCrunch, and across other brands: Really tapping into an extremely active audience where people are used to being part of the conversation,” Hayden said. He also said that Go90 budgets are healthy, and sees the gap between digital and traditional production budgets closing. “Lots of forward-thinking production companiess think of (digital) as a way to dip toes into something that’s unavoidably going to be the future,” Hayden said. “So it’s not just cheap stuff anymore,” Bulkley remarked, switching gears to ask whether Hayden worries about where his content appears, given that it’s harder to control what platforms it will travel to. “Where does branded content sit in your organisation?” Bulkley asked. 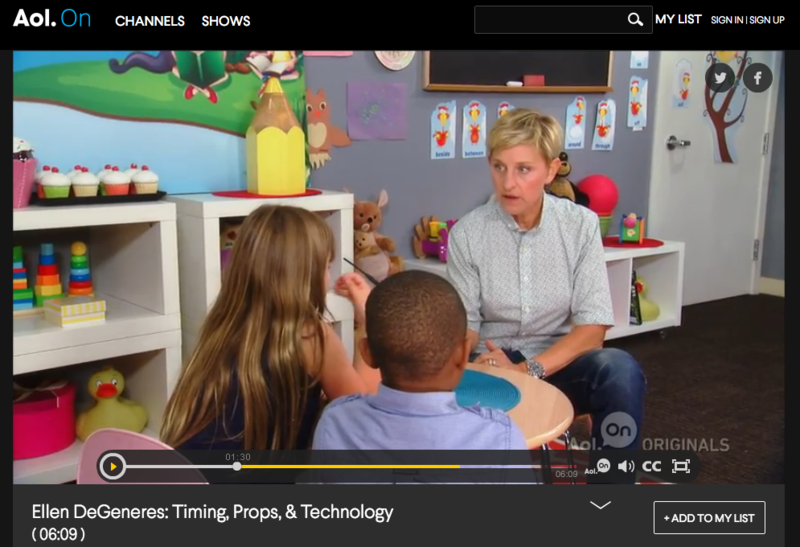 An example of such branded content was for Laugh Lessons with Ellen Degeneres: In each episode, a different comedian sat down with kids and worked through their problems using a comedic technique. “They had a great Rolodex to bring comedians in, and Carnival Cruise Lines came to sponsor it. We didn’t integrate them into that original series, but we offered them a branded series under the same umbrella called Laughs on Deck. That ran on an AOL site,” said Hayden. He brought up that time, years ago, when 3D televisions were all the rage. Then they vanished into oblivion, likely because there wasn’t sufficient 3D content out there to justify a behavioural change among consumers, he said. “It’s easier to go to a theatre and put 3D glasses on than it is to have everyone put 3D glasses on,” Hayden pointed out. In the next six months, though, Hayden is looking seriously at live streaming.